A mixture of botanical garden and contemporanean art museum, the Inhotim Institute is one of the most beautiful and surprising tourist destinations in Brazil. Opened in 2004 at an old farm that used to belong to an Englishman named Timóteo – and known in the area as “Nhô Tim” – the park unites vast diversity of vegetable species, with particular reference to the collection of palm trees and the representative art work collection from Bernardo Paz, retired entrepreneur from the mining and steelworks business. 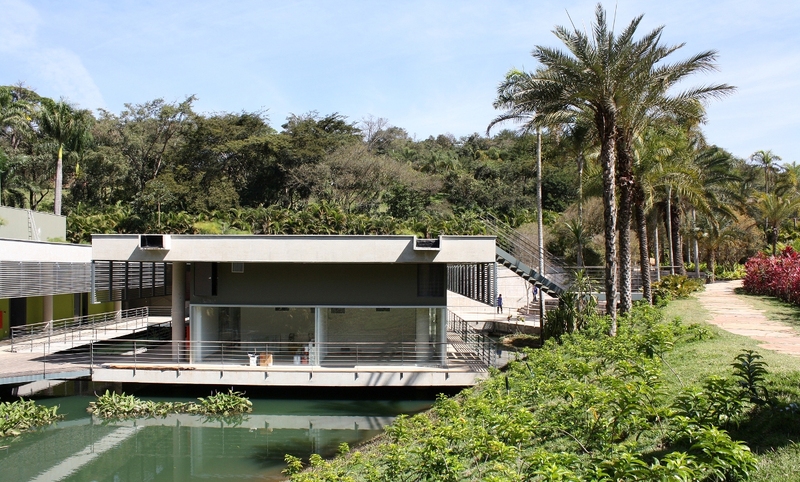 This Saturday, the tourist who visits Inhotim, located one hour from Belo Horizonte (MG), will be able to see more than the works of Hélio Oiticica, Adriana Varejão, Tunga, Vik Muniz and Cildo Meireles. At 2pm there will be a special screening of the film ELENA at the Burle Marx Education and Culture Center, one of the institute’s pavilion. The entrance is free and the tickets will be distributed on a first-come first-served basis, from 1h30pm on. The organization has also invited the director and researcher Carla Maia, member of the collective Filmes de Quintal, that organizes the festival forumdoc.bh, to comment on the film and conduct a dialogue with the public soon after the session. We will be very happy with your presence. Below is the electronic version of the invitation, for you to copy and send to your friends! Enjoy!